Going Toggin: Was getting a lot more bites & throwbacks, tagging more, before this long dry Nor-Easter started. Water's warmer still. Some anglers will do OK - not everyone. Going Tuesday, April 19th & Thursday, April 21st - 7AM to 3PM - $110.00 - 12 Sells Out..
& Sunday, April 24th - 7AM to 3PM - $110.00 - 12 Sells Out. Will Open June In My Next Report. Reservations Required - See Way Down Below - & Be a half hour early! We always leave early! 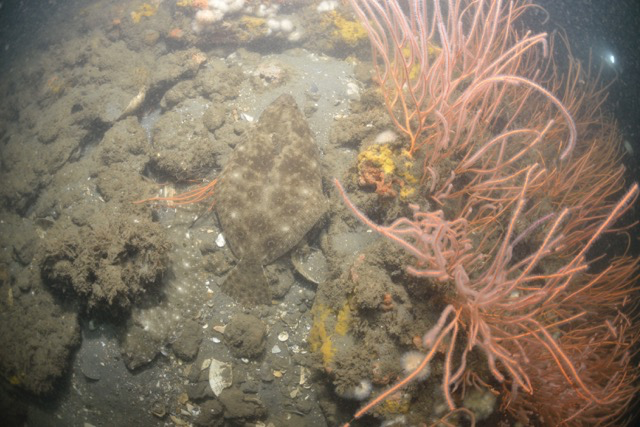 A flounder lies in ambush on a patch of our remaining natural reef. They often hide a lot better than this one.. Flounder aren't usually thought of as a reef fish, yet reef is where they feed a good part of the year & where they spawn come fall. While I believe traditional traps/pots do little damage to a reef, no one would ever say the same about trawling. Yes, this bottom survived. What we see & imagine here as "rock" is actually a very soft compressed clay affair, perhaps marsh peat from tens of thousands of years ago. Animals routinely burrow in it. A piece of this 'rock' can easily be snapped off in the hand and turned into mud..
An honest piece of rock might be trawled which removes nearly all growth, and then allowed to regrow after part of a decade if it's not trawled again. It'll still be rock. Gonna take a dern site more than a trawl's chain to alter granite.. However, areas of this softer compressed clay, or perhaps even peat, 'hardbottom' are at risk of permanent loss. Bottoms such as this can & have-been turned into smooth, featureless, un-colonizable bottom where reef cannot regrow. Old-timers have told me tales of catching sea bass while drift fishing for weeks & months on end at the same reef; reef they easily located without any of today's sophisticated navigational electronics. Some of these places have no remaining natural reef growth & no sea bass today, but do have stories of intense hydraulic clamming & some trawling in decades long past. I have to infer habitat damage in large, multi-square mile, area. Marine fisheries restoration has but one goal in the Mid-Atlantic. Halt overfishing. Rebuilding marine fish populations is presently 100% about catch restriction. Fisheries management will not get better result from our economic battering until science has keyed to age at maturity. The true strength of fisheries management is in forcing spawning production. The concept of "Maximum Sustainable Yield" (see Magnuson-Stevens Act) really was Congress's goal - not regulatory destruction of as many fisheries as possible. MSY is achieved when 'surplus production' is removed (by fishing) without harming population levels. That's why we can catch, sometimes amazingly, while having even more fish the following year. It's really hard for someone steeped only in catch restriction to grapple spawning production as something management can influence. We presently have fewer sea bass off DelMarVa than when Foreign Factory Ships could be seen tending mammoth trawl-nets from shore, without binoculars, yet had the highest sea bass population anyone can recall just 13 years ago.. Still, present spawning production level accepted for what it is; If you have 100 acres of trees and log it down to 5 acres, will you truly expect to maintain the same one-hundred acre yield of squirrels? This is pretty low-hanging fruit in conservation philosophy - habitat matters. NOAA's current plan: "What Trees? We only see sand & mud." ..and besides, all your DelMarVa sea bass got way too warm and swam to Massachusetts. That's a truly sad, sorrowful thing to call science. Undiscovered & unresearched, a habitat restoration plan for our hardbottoms is no closer than travel to our nearest galaxy. Both no more than theoretical, sure would be a lot cheaper to understand & re-reef the nearshore..
Dang.. This NE wind is a pain in the neck. Haven't been out toggin in a good while. Slipped off just a few miles Wednesday, the 6th, and caught pretty decent. Would have had a boat limit (with very few clients!) but we'd thrown back some keeper females.. Danny & I even kept one for dinner. Then, in a lot more wind Friday, we caught plenty of throwbacks & just one keeper. Howling harder still, I headed in early with a big credit toward another day..
..that fresh tog though, Tasty! This winter's been so miserable I only have one pack of frozen sea bass left - fluke's gone. Been looking for a decent shot of weather. Rare bird this spring, but here it comes. I learned at a fisheries meeting a week ago that cobia will close this summer - a federal closure. I cannot imagine NOAA/NMFS have any real idea what this fish's actual population is. I do know cobia can be swimming all around live bait and flip you the fin. The pattern is a perfect fit: this is simply a spike in the data like every other I've ever written about. If any difference exists, it's that MRIP catch estimates showing the average Mid-Atlantic private boat-caught cobia at 48 pounds apiece offer a new high in statistical lunacy. What the heck. If it were true, these super-cobia would be the greatest managed fishery creation in history. Another twist, however, & in perhaps the grossest misuse of fisheries regulatory power yet, the South Atlantic Fishery Management Council (SAFMC) is closing a fishery entirely out of their jurisdiction. Because VA is on the Mid-Atlantic Fishery Management Council - MAFMC - the cobia fishery above Hatteras, specifically VA, will have been regulated by a body where VA has no representation. Takes us right back to the founding, doesn't it..
Now, I've been asking for a couple days to see a specific data set formative in this new potential closure--each day working further up the food-chain. It's interesting to me the "Average Weight (lb)" of a cobia climbs from 19, to 28, to 48 pounds over a three year period. This is the stuff of mythology, not fisheries science---promise. It was none other than Dr. Van Voorhees who told me MRIP estimates have an especially hard time with weights..
We saw how in May/June 2010 Massachusetts Private Boats were observed with 2 sea bass. Those two fish became 645,000 pounds of quota-crushing "recreational catch." I really wish I were either wrong, or kidding - I'm not. I bet just 2 or 3 cobia were seen. Those observed fish, at least one a monster, will become another closed fishery. Surely some readers here are dialed in, have established contacts in Congress or in Fisheries, (or are Fisheries..) I'm having some difficulty getting the "number & weight of each cobia actually observed by MRIP field interviewers." Readers from North Carolina & Virginia should ABSOLUTELY contact their Congressman & Senators to also request info on how this "average" came to being. My Question & Data Request: I would like to know how many cobia were found by field staff & weighed -- and what those weights were -- that formed the Mid-Atlantic Private Boat estimate where the "Average Weight (lb)" became 48lbs for Cobia in the Private Boat mode. What specific fish were observed? Pretty sure it's NOT going to be a very large table. With a good internet connection it takes very little time to pull data from the MRIP system. There are incredible layers I am not privy too though, unless I beg real pretty.. I didn't ask pretty enough. If you get a response, please send it along..
MRIP Sez: In the 22 years from 1981 to 2003 Private Boats fishing along NC's coast caught 426,000 pounds of cobia -- all those 22 years, all put together, 426,000 pounds. Then, in 2015 alone, they caught 472,000 lbs..
Charter skippers from North Carolina & Virginia seem rather alarmed that they're clients' fish are smaller & not as numerous. FINAL 2012 MAY/JUNE COBIA INLAND . . . .
All Mid-Atlantic Weight Average - Are charter operators unable to land fish even HALF as big? All Atlantic by mode: MRIP's latest Fishery-Closing Catch Accusation. PRELIMINARY 2015 COBIA BEACH/BANK 0 . 0 . PRELIMINARY 2015 COBIA SHORE 0 . 0 . Party/Charter chugs along at a normal pace, gets a fairly normal annual estimate, if up a touch. MRIP then shows how fishing's professionals & their patrons missed yet another searing run--in yet another fishery, when Private Boats land a new Atlantic Coast record. ..and one more bubble in a pot coming to boil. Although people who do not own a boat vastly outnumber those who do, and we For-Hire operators often carry boat owners too; MRIP has Party/Charter carrying almost no one, while Private Boats now rival the raw extractive power of industrial pair-trawlers. There must be, in MRIP's way of thinking, a great deal of Private Boat effort that only goes out on foggy nights - a ghost fleet capable of incredible landings - a mysterious unseen fishery where any one state's Private Boats are often able to outfish huge swaths of multi-state commercial effort.. The very reason we went to a fishing license or 'registration' was to remove that ignorance from recreational catch estimates. We are, by now, supposed to know almost exactly how many people are going fishing recreationally. MRIP, however, remains quite certain many people are not registered. I swear, it seems as though they also believe canoes are trawlers too. MRIP knew Congress & the National Academy of Sciences wanted them to use the new license info - the new "head count"- to better calculate catch. MRIP's new mail-in survey may be ready next year. Might. I think the delay was so they could build more stables for Pony Express. This business of using MRIP as a certain guide to actual catch has got to stop. When government is using data a child could logically refute to close fisheries commerce -- "because they have to" -- then we have to take action and demand legislators make repairs to fisheries law. Below is a letter I wrote to the Secretary of Commerce, Mrs. Penny Pritzker, and a whole bunch of folks under her. Feel free to share it with anyone you wish, including contacts in State & Federal government, and especially Congress! Ask how many cobia they saw & weighed in VA to form that 48 pound average too..
Capt. Monty Hawkins 4/9/16 -- Someone Please Help.